For a fact, Tata Motors is going slow on the Nano Diesel project. Yet, the Indian automaker continues to test the diesel engine equipped Nano on Indian roads. The diesel powered Nano was spotted on testing runs at Pune. The diesel engined Nano comes with the facelift that is expected to be first seen on the petrol powered Nano. The facelift was showcased at the 2014 Indian Auto Expo through the Nano Twist Active concept. As detailed on the Nano Twist Active, the Nano’s latest facelift will involve revised front and rear bumpers, a hatch lid that is openable and a larger fuel tank. The 623 cc petrol engined version of the Twist Active will also get a five speed automated manual gearbox. The diesel Nano, if it ever makes it to production, is expected to get all the feature additions of the Nano Twist Active Petrol variant apart from the automated manual transmission (AMT). Tata Motors is testing two other Nano hatchback variants, the Twist Active AMT and the 1 liter-3 cylinder petrol engined model. The AMT equipped Nano Twist Active will be the first of the two variants that will see a launch. 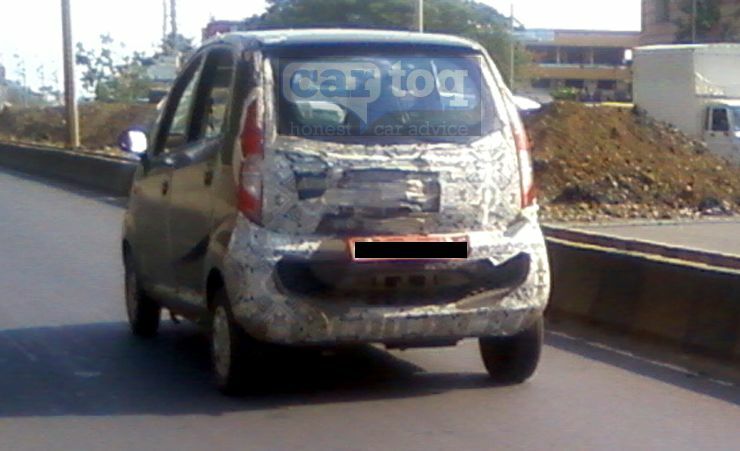 Late 2014 or early 2015 is when Tata Motors is expected to launch the AMT equipped Nano in India. The Nano AMT is likely to be the least priced automatic car in India and the world. The larger engined Nano could take longer to be launched as the car will see more changes to the braking and tyres to hande the additional power of the larger engine. Expect disc brakes on the front wheels and larger section rubber on all four tyres of the larger engined Nano Petrol. The price of the larger engined petrol Nano is likely to nudge the 3 lakh rupees mark. At these price levels, the car will go directly against the Maruti Alto 800 and the Hyundai Eon.